The kitchen and the back-kitchen are about the same size - more-or-less the same as most people's living rooms ie; 30 sq metres. There are red quarry tiles throughout, though in the back kitchen some were so perished that we were forced to replace them with modern ones. Outside the kitchen window was a decorative tree of some sort - not a leylandii, but that kind of thing, which had grown so massive that the room was dark and gloomy, even slightly spooky. We had it cut down, along with one other outside the living room windows. 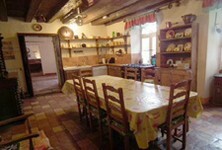 A huge and very heavy curtain split the kitchen in to two, with the fireplace and an old range on one side. The old range had rats nesting in it and was too broken to repair (though I now wish we had tried) and for those first few weeks, we cooked over the open fire. Just pork chops, and that kind of thing, in a big old pan. My hair was in a long plait down my back and one day it fell over one shoulder and almost caught on fire as I bent over the chops! Happy days! On the other side of the curtain was a narrow iron bed with a real old feather mattress, duvet and pillow - you know, one of those sausage-shaped pillows the French have and a few small bits of furniture. None of the furniture was worth saving, riddled with woodworm and in poor condition, apart from an old butler's chair which some clever person had painted in orange gloss (deary me!) and a lovely little table which we later had dated to around 1600. Hanging from the beams and from various hooks were a variety of pots, some of which were copper, some so dirty that it was difficult to make out what they were made of. Most of these we cleaned up and kept. 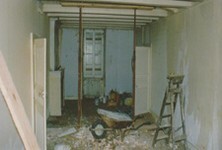 Between the two rooms is a corridor, or back lobby, with what was at the time of purchase a huge walk-in coat cupboard. In here we found Nazi jack boots and a few other items of Nazi paraphernalia, including maps. We donated it all to a WWII museum which, unhappily, closed down a few years later. This little room was then converted in to a downstairs WC with basin. The kitchen beams are amazing. You can see the adze marks quite clearly. Each beam is an entire tree and the craftsman would straddle the tree trunk, once the tree was down, and hack away at it with an adze. This gave it the square shape needed for the beams. It makes you realise the massive quantity of work that went in to these places, years before cranes and electric drills and saws. You can see it in some of the stone work too - on the step in to the kitchen from the hall are very clear marks where the stonemason chiselled away. The basin was in the back-kitchen, or scullery as it would have been called. Flung out in to the grounds was a massive stone sink, hundreds of years old, which we rescued and put on display. Old stone sinks like this were very shallow and they were used as much for keeping meat and fish cool as for washing up. We had no money, so for many years both the kitchen and the back-kitchen were a haphazard mix of a small fridge and a cheap gas cooker, crockery stashed on to temporary shelves and an old sink in the wrong room. All mothers need a washing machine too - in fact a washing machine is a must for me, regardless of anything. Some time later we had some kitchen cupboards made by a carpenter by the name of Rene Jean-des-Champs (Rene John-of-the-Woods - lovely!). Barely a month after he had finished this job he fell off a roof (elsewhere) and broke his back. When he finally recovered, months later, he had permanent damage to something in the nerve centre, so that he could either walk or he could move his arms, but he couldn't do both. The stair gate at the top of the first flight of stairs was made by him, and with this handicap it took him weeks and weeks and weeks. But he needed the work and, although it is not a good job done, we have kept the gate as a sort of homage to him.